I’ve got something special planned here on the blog this week! Rather than my typical once (usually Tuesday) and sometimes twice a week posting schedule, I’ll be blogging here daily, all this week (well, today through Saturday anyway), and I’m posting on a theme. 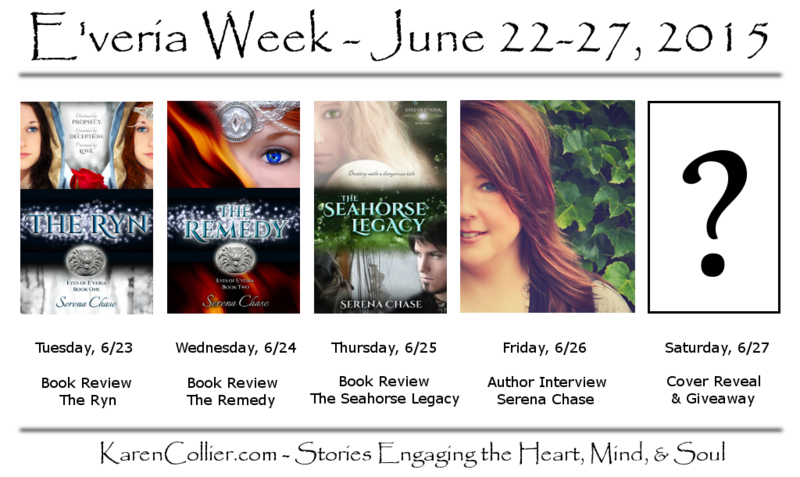 I’m unofficially calling it “E’veria Week” here in my little corner of the Web, after the Eyes of E’veria YA fantasy series written by my blogging buddy Serena Chase. I’ll be posting about this fabulous series all week, including reviews of the first three books, an interview with the author discussing (among other things) the origins of the series and some hints about what’s to come in the fourth book (scheduled to release late this summer – YAY!) Then on Saturday, we’ll wrap up the week with a look at the brand new, freshly redesigned (and simply gorgeous) cover for The Seahorse Legacy. Also on Saturday, there’ll be a chance to enter to win a lovely prize pack from Serena, so don’t forget to stop by! In fact, if you haven’t already, consider subscribing to my blog for the convenience of having posts sent directly to your inbox. Whether you’ve already read books 1 through 3 and want to reminisce while we await book 4, or this series is brand new to you, I hope you’ll take the time to stop by!